You know how the Nexus One is a piece of hardware by HTC that runs Android, a piece of software by Google? That's how Google TV will work. 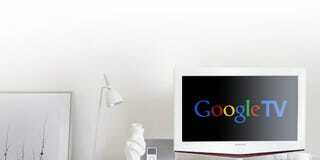 At its heart, Google TV is a platform. It's software. Hardware makers will need to step up to use it in their devices. Right now, there are three places we'll see Google TV: a set top box by Logitech, Sony televisions (and one Blu-ray player) and an upcoming DISH box. They all share the following common specs: An Atom (or better) processor, discrete GPU, HDMI-out, Bluetooth, IR (with a transmitting "blaster"), Wi-Fi, and Ethernet, all while supporting a keyboard and a pointing device, as well as more traditional remotes such as Logitech's Harmony universals. From what we understand, all of these products will be available at Best Buy in fall of 2010 (though it's possible DISH may be later). Equipped with an IR blaster to change channels, Google TV can sit on top of your existing infrastructure. So while new hardware is in the works, it should be compatible with whatever you're using now—cable or satellite boxes, with all relevant subscriptions. When you start any Google TV device, you're greeted by a simple search bar. You type what you'd like to watch. That can be a television station, allowing you to select and tune that channel. Or it can be a show, which will point you to places you can find the show—be that through a cable subscription channel, Netflix or somewhere on the web. So say you want to watch something that only exists on Amazon's streaming service. You'll be taken to Amazon's webpage through Chrome, where the video will stream. Random websites might look crumby on your television, of course, which is why Google asks that sites optimize for Google TV (full SDKs available in 2011). With this mix of web and television, you can also view multiple sources of information in multiple panes. So you can watch the Sox game on one part of your screen while reading Paul Konerko's realtime stats in another. Thanks to required Google TV hardware specs like Bluetooth and Wi-Fi, you'll be able to load a webpage on your Android phone and beam it to your TV. You can also use your Android phone's voice recognition, effectively making it possible to change channels or search for shows just by talking. Oh, Google TV includes complete access to the Android App Store. And Google suspects that most any app will run fine on the platform, though those designed with cellphone-specific hardware in mind might not work with 1:1 compatibility. But when the SDK is available in 2011, we can expect Google TV-specific apps, too. I'm pretty sure the audience cheered at this part. And when Google says Flash, they mean the videos and the games. ...that is not Chrome OS. Remember Chrome OS? Google TV and its apps have nothing to do with it—not at the moment, at least. You're caught up on Google TV! Now you can check out what's up with that thing called Froyo.